There's no need to panic if you’ve forgotten your password : just follow the steps below! 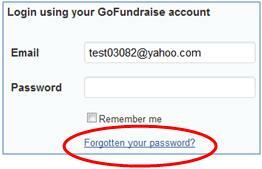 Click ‘Login’ on our webpage, www.gofundraise.com.au. It can be found in the top right-hand corner. Enter the username email address when prompted, and then click ‘Submit’. Password reset instructions will be sent to this email. Click on the link in the email (or copy and paste it into your browser). This will take you to the new password page. Enter the details as prompted. Once you have submitted this you will be prompted to sign in. simply, sign in with your new password. PLEASE NOTE: If you are taken to the GoFundraise home page when you click on the password reset link, this usually means you are already logged in. Please check the top right corner for a 'My Account' menu label to determine if you are already logged in. Any issues, please Submit a Request to our customer support team.